Nordic culture revered battle, finding a distinctive pleasure and beauty in combat that baffled many other peoples of their day. 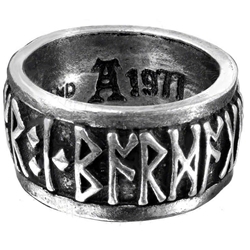 With the Runeband Ring, we see runes that recite a mantra fit for a Norse warrior. This simple band consists of a pewter band that wraps around the finger, while the band itself is set with raised Nordic runes that read, Poetry is in Battle. With a single message, this odd statement reveals that even in the rough and frenetic confusion of combat, a warrior can find something as soulful and as beautiful as poetry. This ring is made from quality pewter metal that has been hand-cast to ensure the utmost detail possible. Simple, elegant, and intriguing, this Runeband Ring is a great accessory for any philosopher of combat to adorn their person with, as well as a great accessory for modern-day Vikings and warriors to wear when showing their own unique love of conflict.